Happy 14 months (+1 day) to my sweet girls. Quinn is an extremely proficient walker. I will often let her out of the stroller to walk next to me. We are in a walking bootcamp, of sorts, to get her to follow instructions. Currently, she thinks it's hilarious to make a break for the street while we're at the park (again and again...and again). When she doesn't listen, she is promptly put back in the stroller. When Teagan does walk, she is very stable on her feet. She has taken up to 10 steps, but won't do it very often. She is still nervous and will usually resort to crawling. She'll do it on her own time! Their comprehension is excellent. I can ask Quinn to bring me the wipes, a book or her shoes and she will do it. They both understand that they must sit down and not stand on their reading chair (otherwise it is taken away). They can identify several objects/animals in their books when asked; dog, cat, lion, rabbit, cup, ball, chair, apple, banana...there are probably more! While they understand a few signs very well (milk, more, eat and all done), they rarely use them. I'm not too sure why. Quinn finally signed milk at me the other day. We are still dealing with the biting, although it doesn't happen as often. Quinn is usually the biter. Right when she bites, she is removed from the situation and ignored for a minute. We then ask her to apologize to Teagan, which means giving a hug and kiss. I was reluctant to discipline them like this but I've quickly realized that they know exactly what they've done wrong. They understand far more than we realize! Teagan has become fascinated with art. She loves to look at framed artwork and photos. Our twice-a-day trips to bed for naps include many stops to discuss artwork along the way. They have both started waving regularly. They will usually wave when we tell them to "say" hi or bye. They will wave goodbye to Jenn in the morning, unless they're too into their breakfast. When I tell Quinn that it is naptime, she will start waving "goodnight." They both love fish and recently tried scallops. Quinn adored the scallops and ate Teagan's leftovers. They both loved the kale chips that I made last week. A new favourite snack or breakfast is almond butter on rice toast. Going in for a big kiss! Lucky Finn! "Sooo, what do you do all day?" This question for a stay-at-home mom is on par with the "you're huge" comments for a pregnant woman. As other stay-at-home moms can attest, this presumptuous question, usually asked by non-parents, can be incredibly frustrating and can even evoke feelings of anger. Sometimes when I'm asked how my day was in a casual way and not the you-probably-watch-soaps-all-day way, I feel like I don't have much to say. We will have taken the dogs to the beach, run some errands and had a play date with friends, but collectively, that would have only taken up a few hours. Yet, when I think about it, I realize that I barely had time to eat lunch. What did I do all day? I think. I then start to feel guilty. Did I waste time? Did I not do enough?! My guilty feelings are quickly pushed aside when one baby starts grabbing my leg, the other baby falls flat on her face and is screaming, the dog starts barking and washing machine beeps that it's finished. Why Don't Friends With Kids Have Time? Best friend has child. Her: exhausted, busy, no time for self, no time for me, etc. Me (no kids): Wow. Sorry. What'd you do today? Her: Park, play group . . . Okay. I've done Internet searches, I've talked to parents. I don't get it. What do stay-at-home moms do all day? Please no lists of library, grocery store, dry cleaners . . . I do all those things, too, and I don't do them EVERY DAY. I guess what I'm asking is: What is a typical day and why don't moms have time for a call or e-mail? I work and am away from home nine hours a day (plus a few late work events) and I manage to get it all done. I'm feeling like the kid is an excuse to relax and enjoy -- not a bad thing at all -- but if so, why won't my friend tell me the truth? Is this a peeing contest ("My life is so much harder than yours")? What's the deal? I've got friends with and without kids and all us child-free folks get the same story and have the same questions. Relax and enjoy. You're funny. It's doing all this while concurrently teaching virtually everything -- language, manners, safety, resourcefulness, discipline, curiosity, creativity. Empathy. Everything. 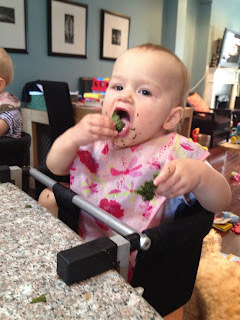 I wrote a guest blog post about kale for my friend and fellow nutritionist, Justine. I'll link to it as soon as it is up. I made kale chips this evening in order to take a picture for the blog. I pulled them out of the oven, just as the girls were finishing dinner. I love kale chips and usually dive right in when they come out of the oven. I gave the girls some to try and they were a HUGE hit. I'm talking every-baby's-love-for-fruit huge. If they didn't have kale chips in front of them, they would growl and yell at me. I couldn't get a good picture of Teagan, who also loved to crush them in her hands, but here's a good picture of Quinn, who probably devoured half of the tray herself. Note: Resist the urge to increase the temperature. Cooking at a low temperature dehydrates the kale and preserves much of the nutrition. Also resist the urge to add more oil because that will only make the chips soggy. I watch a man at the dog beach trying to round up his dog to leave. The dog is having a blast fetching stick after stick in the water. I think they had been there for a while, although the dog probably could play fetch for another hour. He calls the dog over to him. No response. He tries to grab his collar. The dog is too agile and darts away quickly. He calls him again. Nothing. He tries to play it cool, not wanting to be that owner with the disobedient dog. After a few minutes, he starts the round up process again. Still no luck. I'm at the dog beach with Teagan in the stroller, Quinn in the Ergo and Riley and Finn running free. Without fail, I get a "you have your hands full" comment before I've even crossed the parking lot. It's time to leave for the five of us. I start walking to the gate. "Riley! Finn! Come!" I yell. Within seconds, both dogs are at my feet. I hook their leashes on and I'm out the door. While Finn has always been this obedient, Riley has not. I was that owner I talked about above. Riley was a little devil. At 16 months old, he ran out of a dog park after a police horse, towards a very busy Toronto street. You should have seen the looks that we got from the other dog parents. When I arrive at the dog park with my brood, I have a system. I open the trunk of my SUV. The boys anxiously wait to hit the ground running (literally), but do not move until I say so. I then get the stroller out and put one baby in it. I put on the Ergo and put the other baby in that. The dog beach has thick sand so pushing a double stroller is too challenging, hence the single stroller. I then give the boys the go ahead. One more quick story...A few months ago, I arrive at the park, open the trunk like I usually do and both boys leap out and run straight to a woman and her dog. I yell to the boys to get back to the car. They promptly run back to me and jump back into the trunk until I'm ready. "Wow, I wish mine was that well-behaved!" the woman says to me. I smile and tell her that it has taken A LOT of work to get to this point. It has. With two babies in tow, I'm incredibly grateful to have two very well-behaved dogs. I took the girls to a trial music class the other day. While we did many classes over the last year, we haven't done one in months. I now have a very proficient walker and an almost walker/very proficient crawler. Lucky for me, in a class of about 10 other moms, I had the only walker. Most babies were under 6 months so they didn't move much. Teagan and Quinn were all over the place. Grabbing papers from the instructor. Trying to steal her iPod and remote. Opening her bins with musical instruments. In T&Q's defense, it was all at their level. She really can't expect 1-year olds to not get into those things. They weren't badly behaved, they were just being typical toddlers. After the class finished, we headed out into the play area. Immediately, Quinn ran one way and Teagan crawled at lightening speed in the other direction. It was very busy in there. I called Quinn, only to be ignored. I tried with Teagan. No response as well. A short time later, it was time to go. I grabbed them both and headed to the front to pay for my Americano. I put the girls down to get my wallet out. Within seconds, Quinn ran back into the play area and Teagan started climbing up onto random strollers. The Mom holding her peanut-sized baby (ONE baby) shot me a judgmental look. You just wait Lady, I think. I round them up yet again because my verbal commands are met on deaf ears. With two babies and a diaper bag in my arms, we leave the cafe. All I could do is laugh. We head home, pick up the dogs and hit the dog beach. While standing in the back of the SUV, with dogs passing within a few feet of them and the lake in view, Riley and Finn don't budge. Can you teach your sisters how to do this, I think. Our sweet T has found her walking legs! Two little girls who woke up on the wrong side of the crib. A mommy who woke up exhausted after being up in the night with one little girl. Two little girls who then decided to boycott their naps, giving Mommy zero time to even make breakfast for herself. One little girl who screamed at the top of her lungs in Mommy's face. Two little girls who only wanted to be held, annoyed that there are two of them and only one Mommy. Two little girls who would scream if Mommy tried to put them down. Yes, I know. It was probably teething! When it was clear that naps were being boycotted and they came back downstairs, they both melted down. Quinn screamed her head off and Teagan lay on the floor crying and kicking. Mommy rested her head on the counter and took a few deep breaths. Mommy then sat on the floor with a boppy and brought out the big guns, silencing two overtired and cranky 13-month olds in an instant. After their milk fix, they calmed down, but continued to be extremely clingy. They didn't want to be near Mommy, they wanted to be on Mommy. Neither little girl wanted to share Mommy with the other. They held Mommy tight, giving big hugs and kisses. My day was completely draining. Those two little girls exhausted me. In my very brief moments of silence today, I actually realized a few things. There will come a day when breastfeeding won't be their soothing method of choice. There will come a day when they won't fight over who gets to sit on my lap. There will come a day when they won't want to grab my neck and hold on tight. There will come a day when they won't want to willingly plant a kiss on my cheek. While in the park the other day, a Mom was trying to round up her two boys to head home for lunch. Let's go Alexander and Matthew! Time for lunch! She called to them. Alexander and Matthew ignored her and kept playing. Let's go!! She tried again, a little bit more sternly. Still no response. She then ventured into the playground and attempted to grab one of the boys. He was far too agile for her and darted under the slide. She lunged for him again with no luck. Do you want a gummy worm?! Mmmmmm!! She said, attempting to bribe the boys. You can have a gummy worm! The boys weren't fooled. Ok, fine. You can have five more minutes. The mom resigned herself to more playground time and parked herself on the swing. I gratefully walked out of the park with my girls, who still don't move fast enough to avoid me. We enjoyed a snack on our blanket a few metres away from the playground. Thirty minutes later, the Mom and her boys leave the park. No judgement. I can only imagine how tough it is to get kids out of the park when they're having a blast. Quinn already throws a fit when we have to leave the park. How do you get your kids to do something that they do not want to do? 407. 407 days ago, my other relationship and I met. Since then we have been inseparable, rendez-vous'ing at least once per day, but in the early days up to eight times per day. She's been in cars, on planes, gone on vacation, traveled to the US and across Canada and even been with me while I BBQ'd dinner or made breakfast. Yesterday, was the first day, in 407 days, that my other relationship, my Medela Freestyle pump, and I did not have a date! It was a break up of sorts for Medela and me. I might have slightly caught her of guard, but if you read my post linked above, you would know that I was ready. Medela and I will still see one another, but we will have occasional coffee dates, as opposed to standing 9pm post-dinner dates. I was pumping for T&Q's bedtime bottles, but have managed to "train" my body to make enough milk to nurse them both at bedtime. They are both still nursing four times per day. Farewell Medela, my friend! Thank you for your dedicated service! I think we, parents of multiples, occasionally forget that even though our children were wombmates, they are the same. My girls couldn't be more different, as I've blogged about many times. But, where I desperately want them to be the same, is in their sleep habits. I want them to both sleep for 12 hours per night, every night. I want them to both nap at 9am and 2pm every day. Am I asking too much?! Quinn goes down like a dream at 9am. Teagan does not. In T's defense, she is usually not tired. I still put her down because she doesn't normally cry but will chat to herself or sometimes play. Quinn is usually up around 10:15/10:30. At that point, we usually head out to do an activity, meet friends or walk the dogs. Selfishly, if I don't get them both down at the same time, I will never get a minute to myself. Teagan's morning nap is inconsistent at this point, which is why I haven't moved their first nap to later in the morning. Sometimes she's exhausted at 9am and will fall asleep almost immediately. Fellow parents of multiples...have you ever experienced this? Did you force the same nap schedule or resign to different schedules?